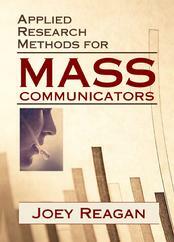 Finally--A Communication Research Text for Working Professionals! College professors who teach research methods have a number of high quality textbooks from which to choose. But most of these books are focused on how to do social science research. Few, in fact, focus exclusively or heavily on how to use that research in the real world. Applied Research Methods for Mass Communicators is designed to solve this problem. It is designed specifically for college students who plan to work in the fields of advertising, public relations and journalism. The focus of Applied Research Methods is on helping future professionals and managers of communication businesses understand, evaluate and apply the research used in their industries. Real-world examples are used liberally to illustrate the basics of research, which include design, sampling, and data analysis. Joey Reagan (Ph.D. Mass Media, Michigan State University) is a professor in the Edward R. Murrow School of Communication at Washington State University in Pullman, WA, where he teaches communication technologies and research methods. He is author or coauthor of more than 60 publications, papers and reports that have appeared in scholarly communication journals and media industry publications. For the past 25 years he also has been a consultant for media, health and governmental organizations. His latest book is Communication Research Primer: Measuring and Evaluating Organizational Communication, which was published by the International Association of Business Communicators.